A clean and happy kitchen is a wonderful thing. Unfortunately, they don’t yet clean themselves. Nobody likes it, but we all have to do it from time to time. People always call and ask how and what they should be using to clean their cabinets. Really, there is no specialized equipment necessary – just some everyday things you already have, a little elbow grease, and a couple of quick techniques will take care of your everyday cleaning requirements. First off, kitchen cabinets grab on to more grease, food particles, dirt, smoke, and grime than most other parts of your home – unless you have a habit of grilling in your living room (which I really wouldn’t recommend). It’s always easier to get them clean if you don’t let the greasy messes set around for too long before cleaning. For everyday cleaning, use a mild dish detergent, warm water, and a soft cloth or sponge. Personally, I like Dawn dishwashing liquid because it helps cut through some of the grease – but whatever brand you are partial to will be just fine. The most important thing is to wring out most of the water before you wipe the cabinets down – you never want water to drip or pool in the detail of the cabinet doors or moldings. If the cabinets look damp after you’ve cleaned them, run over them quickly with a second, dry cloth to pick up the excess water. Just as important as what you do is what you DON’T do when you clean your cabinets. Never use anything abrasive: Soft Scrub, Comet, Brillo Pads, steel wool – none of it. If you have a stubborn spot, use a general multi-surface cleaner (I like the orange oil type, myself) with the soft cloth. If the spot still won’t budge, switch to a nylon scrubby or a ScotchBrite pad, but use it sparingly. This should work on just about any manufactured cabinet finish you have – stained wood, painted, laminate or thermofoil. If you’re wary, it’s always a good idea to test a cleaning product on an inconspicuous spot first. For cabinets with a stained wood finish, there are just a couple more tips specifically for you: 1) Always wipe with the grain of the wood. 2) Definitely don’t leave any water behind – excess water is murder for wood cabinets. 3) When your wood cabinets start to look dry or dull, apply a coat of oil-based furniture polish to bring the life back into them. There are plenty of everyday furniture polishes on the market that are perfectly fine. 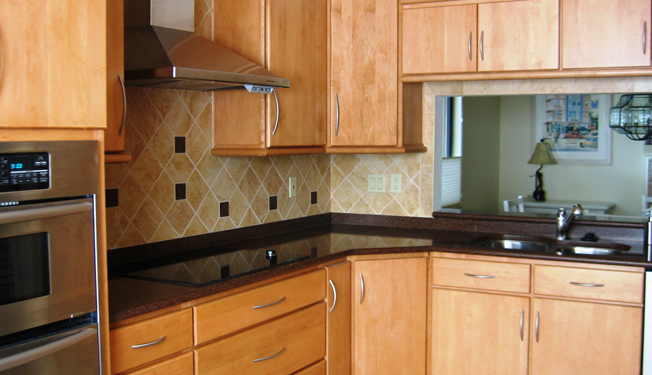 If you want to buy a special product, I like Cabinet Magic – it’s specially designed for wood cabinetry. I know you can buy it at the local Ace Hardware, and I’m sure there are other outlets where you can pick it up as well. If you eschew chemical cleaners entirely, then a solution of equal parts vinegar and water should do just as well for your everyday needs. It even has the added bonus of never leaving a residue like some chemical cleaners can. This entry was posted in Design and tagged cabinets, cleaning. Bookmark the permalink. You took our “kitchen from hell” and turned it into our dream kitchen.